I consider myself very lucky to own an original 1910 copy of this book. It is exquisitely beautiful. As a child, I didn't read it but would stare for hours at the beautiful illustrations by Edmund DuLac. It is very well written, of course, something which, as an adult, I can now appreciate fully. Given the words and phrases used, it does not lend itself very well to bedtime reading for children. But instead, a whimsical journey of lands far, far away for adult Prince and Princesses wishing to lose themselves in traditional fairy tales. It was wonderful to read a more classic version of these tales to my daughter than the Disney versions she knows so well. I'm sure she only caught a quarter of what I read (she is 4) but sat quietly for over 30 minutes at a time just enhanced with the beautiful language. I probably should have previewed Blue Beard first- was a little too dark and graphic for her, but we easily glossed over those parts. I thoroughly enjoyed this book. Quiller-Couch was Helene Hanff's favorite author. I could think of no better recommendation. 3.5 stars. Nice edition, without anything new to add to the tales for the most part. Absolutely stunning -- inside and out. 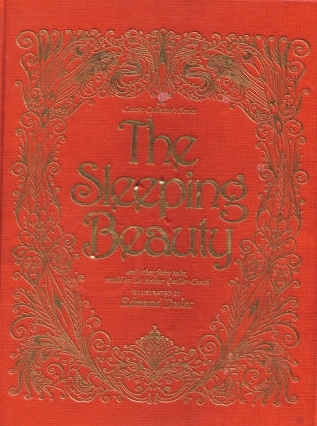 Exquisitely illustrated, this book contains four stories: "The Sleeping Beauty," "Blue Beard," "Cinderella," and "Beauty and the Beast." This is not for the kiddies, but is a beautiful addition to the shelves of collectors and those fairy tale lovers who remain young at heart. Arthur Quiller-Couch - Sir Arthur Thomas Quiller-Couch was a Cornish writer, who published under the pen name of Q. He is primarily remembered for the monumental "Oxford Book of English Verse 1250-1900" (later extended to 1918), and for his literary criticism. He guided the taste of many who never met him, including American writer Helene Hanff, author of 84 Charing Cross Road, its sequel, Q's Legacy, and the putatively fictional Horace Rumpole via John Mortimer, his literary amanuensis.